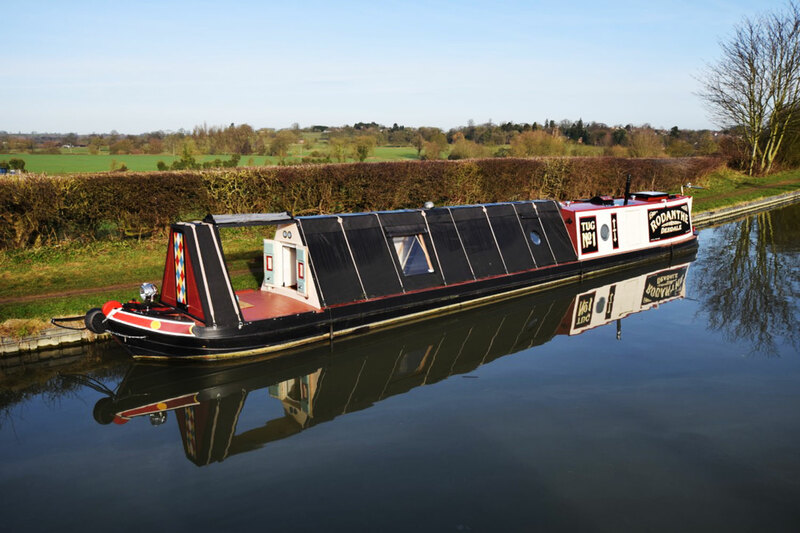 Rodanthe 55′ 2014 under cloth conversion Tug style narrowboat was built in 2014 by the well regarded Andicraft Fabrications and fitted out to a high standard by her current owner. She is in marvellous condition. The paintwork is in very good order, as is the canvass, and the inside is as new. She was blacked and serviced in 2017. Two 3.9kg gas bottles are housed in the foreward locker (with room for more). The 7’ tug deck sits over the insulated water tank and the roll out double bed. The canvass over the deck is quickly removed offering a lovely (and illuminated) outside social area. Access to the boat is easiest from the stern, but possible from the bow door which takes you into the 15’ saloon. A charming space housing two very comfortable armchairs either side of a drop down table and opposite the wall mounted TV. There is a Boatman multifuel stove, and an L shaped dining area with demountable table. The double bed is on rollers and comes out from under the tug deck. The galley follows; lots of storage space in here behind the soft closing cupboard doors and drawers, with the 230v fridge and stainless steel fridge on the starboard side, and a two burner gas hob, separate oven & grill units on the port side. On into the stylish walk through bathroom. A ceramic countertop basin sits next to the towel rail, and the quadrant glass doored shower and Thetford cassette loo are opposite. The beautiful and well maintained Hornsby engine sits in the adjacent engine room. There are two side hatches in here, one with steps, and the various electrical systems for the boat. The boatmans cabin is at the stern. A beautiful cabin offering storage space in cupboards, drawers and under the bench, and the fold away cross bed which makes up a double. The central heating on board is all installed but still needs electrically connecting; 230v is from landline or the inverter, and lighting is LED throughout (including mood lighting in the saloon.) The hot water is supplied through either engine, immersion or Webasto (once connected). Rodanthe 55′ 2014 under cloth conversion Tug style narrowboat is a stunning, young and unique boat, ready to go.